We've entered that time of year again when Apple starts to tempt us with new hardware. But when finances won't allow for a new machine, new apps can freshen things up. 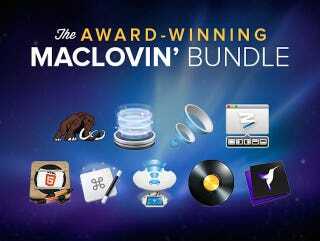 The MacLovin Bundle (incl. Cinemagraph Pro and djay) is a good way to do that – especially with each app included being award-winning. Cinemagraph Pro is pretty much the Photoshop of living photo. You've also got Moom, my personal favorite among window management apps and KeyboardMaestro for text expansion. Last, you've got djay to take care of the soundtrack, with Boom pumping up the volume. Note: Each app in this bundle is award-winning in it's category. You can see all the awards on the deal page, but each app has won either the Apple Design Award, Best of Mac App Store, or Macworld Editors' Choice. Cinemagraph Pro ($100) – Professional quality Trim, Still Frame, Mask and Loop tools offer complete control over your compositions. Also adjust exposure, brightness, contrast, saturation, and vignette of your living photos. djay ($20) – Automix DJ mixes your favorite playlist automatically w/ seamless iTunes integration. NetSpot Pro ($149) – Improve your wireless network performance, find signal leakages, resolve channel conflicts. Keyboard Maestro ($36) – Record and design your own macro shortcuts and activate them at any time. Dropzone 3 ($10) – Quickly launch applications, take screenshots, and upload content on your Mac. Also features easy AirDrop integration — drop files from any app and share them with your other Macs. Moom ($10) – Create custom actions to move and zoom windows via keyboard shortcut or pop-up menu. Also, automatically adjust window size/positions when adding and removing displays. The OS X App Masterclass ($499; first 5,000 customers) – A 22-hour course in coding for Mac – build 5 apps with the Cocoa framework, lean Objective C and Xcode.